IN a typical Indian classroom, today, a lecture-style learning system is the norm. Teachers explain their subjects, while students take notes, focus on understanding the subject matter, give exams and then move on to the next grade. Some students participate in sports, debates and other activities, but for many, overall development is a lopsided affair. However, several schools, today, are adopting a different approach to the schooling process. 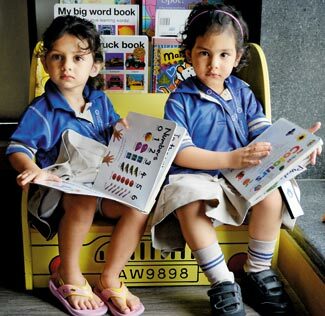 The Sweden-based Kunskapsskolan Education (KED) is one such system, which has established a brand new campus in Gurgaon. The school, opened its doors in April, 2013, and currently has 265 students from pre-KG to Class 6. Like Kunskapsskolan’s other schools in Sweden, the UK and the US, the Gurgaon school aims to combine academic rigour with personal development of students. The latter is a major goal of the school. “We inculcate five values in students – goal-setting, taking responsibility, time management, planning and collaboration,” explains Mats Rosen, Academic Head, Kunskapsskolan, Gurgaon. Interestingly, these are the very values that professionals seek to develop in the world of work. The process of inculcating these values is a long, and structured one, spanning the child’s entire school life. A unique feature of the KED system is that the learning process is adapted to the national board. Hence, in India the school follows the CBSE curriculum. However, learning happens through a mix of lectures, seminars, workshops and personal coaching. The system clearly acknowledges that not all students learn at the same pace, thus allowing students to set goals based on their capability. This gives a gifted student the opportunity to study at a faster pace, while a student with difficulties can spend more time. Students set long-term and short-term goals for themselves with the help of teachers. Teachers play a unique role, which transcends teaching and lecturing. As a subject matter expert, teaching happens through multiple platforms. But more importantly, the teacher plays the role of a personal coach, who follows the child’s progress and development over a period of time, and not just merely the academic year. “During the Personal coaching sessions, students are encouraged to set weekly goals, based on the understanding of his or her capability, supported and mentored by his or her teacher. The achievement of these self-set goals gives them a great sense of pride and accomplishment,” explains Sunitha Nambiar, Program Head at Kunskapssolan Gurgaon. Hence, teachers meet students outside the lecture framework, regularly to review their progress. “Students themselves play a proactive role at following the schedules, and don’t need a parent to do it for them,” shares Sunitha. Teachers have to programme themselves to take a step back from telling students what to do. This is an important aspect of the goal-setting process, where students need to motivate themselves. There is no room for spoon-feeding or rote learning. Hence, identifying the right candidates has been challenging. “Training is an ongoing process to help teachers orient themselves towards the methodology and values of our school. Though we conduct training twice a month for teachers, learning and development happens on a daily basis,” says Sunitha. The current pool of educators come from other CBSE board schools as well as working professionals who believe in the system, and wanted to switch to teaching. Recruitments happen through a psychometric test, followed by GD, and two levels of interview. From Class 3 onwards, students use tablets as the KED system has dispensed with the concept of textbooks. “The entire curriculum and study material are available on the learning portal,” informs Rosen. Students only carry their workbooks in which they write and practise. The learning portal also gives students access to international boards followed by students in the UK, US and Sweden. Of course, personalized attention and facilities come at a price, and typically students hail from upper middle class backgrounds. While parents appreciate the focus of the school towards life skill development, some seem concerned whether academic rigour is a thrust of the school or will be diluted in the process. However, Anders Bauer, Executive VP Kunskapsskolan Education Sweden AB, clarifies that the KED programme works towards the holistic development of students and Kunskapsskolan’s students across the world have been performing extremely well academically and gaining entry into the best international universities for years.